Question: How do I retrieve an eservice? Answer: There are at least three ways to retrieve an eService and we will explain the three best ways below. The Notification of Service email you receive from eFileTexas contains a link to click to retrieve the service document(s). This link is only good for 7 days, however. 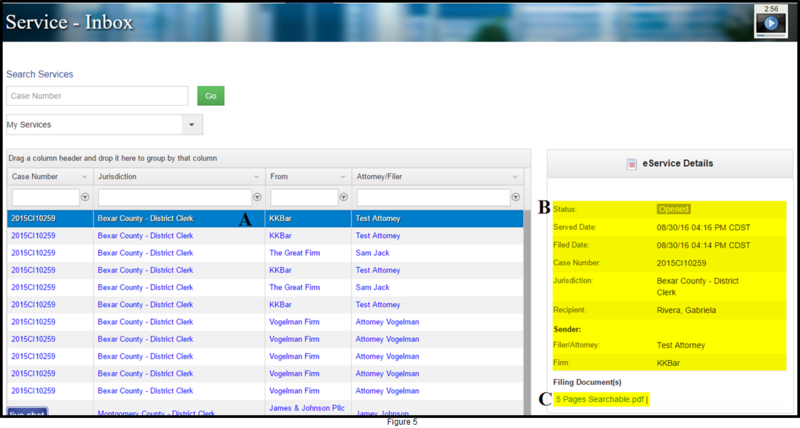 Any firm member can view all eServices received by your firm, by case, in the FileTime Case eService Inbox. And, FileTime saves the service documents for at least six months, and often longer. After logging into FileTime, you are taken to the Cases page by default. If you are searching for cases in which you have eFiled, leave the Cases selector set to My Cases. Change it to Firm Cases to Search for cases submitted by other firm members. Select Archived Cases to view the eServices for closed cases you firm has archived. Click the + sign in the far left column (Figure 1, A). When you do it will rotate downward and the case tabs open below the case. Click the eService Inbox tab (Figure 1, B). 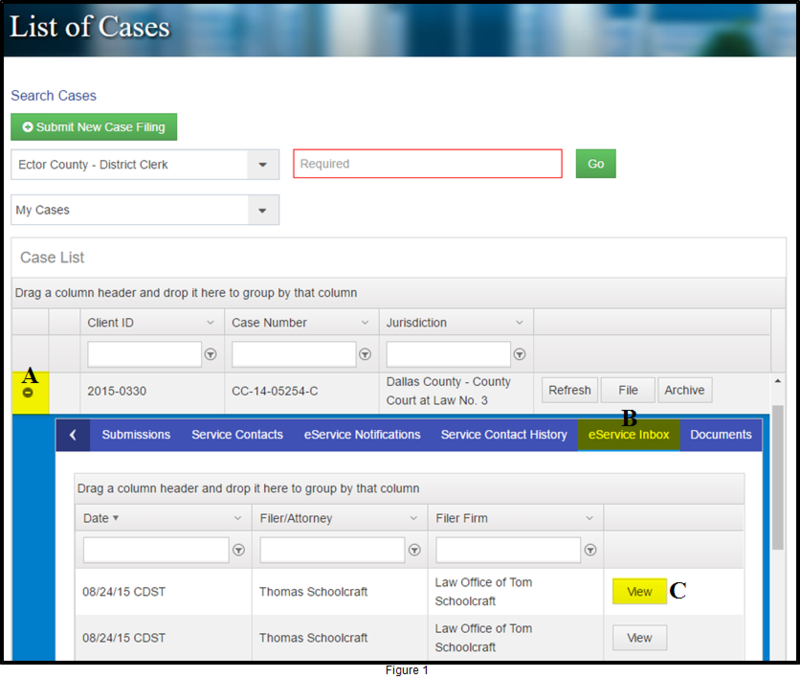 All the eServices your firm has received for the case are displayed. IMPORTANT NOTE: eFileTexas sends eServices for a case to FileTime only after the receiving service contact has submitted a filing, or one has been submitted on his/her behalf. Click the View button (Figure 1, C) and the eService details page opens (below). Click the link(s) to the document(s) to view them or click the Print button. Here is how to access and utilize the Inbox feature. Log into www.filetime.com and make sure you are on the Workspace tab (Figure 3, A). Click the Services button (Figure 3, B) on the sub-navigation bar. Click the Inbox button (Figure 3, C) on the drop-down menu to open the eService - Inbox page (Figure 4). Be sure to select for whom you want to view the Inbox. The selector (Figure 4) will default to My Services or the last selection you made. You can click the drop-down selector and choose a name to view any eServices sent to that specific firm service contact. 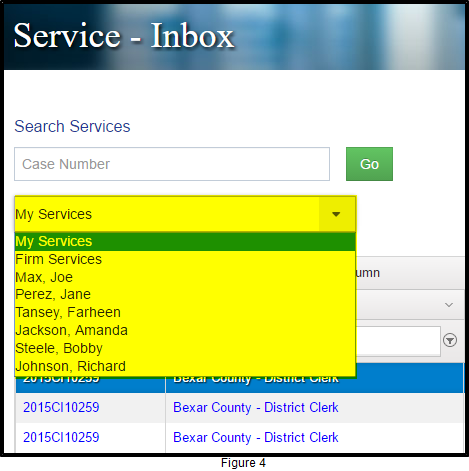 If a name is not found on this list it means that either (1) the person has not been eServed or (2) that person has not yet had an eFiling submitted in his/her name through FileTime so eFileTexas is not sending us eService notifications for that person. On the eService - Inbox page, click the eService you wish to view (Figure 5, A) and it will be highlighted. The eService Details section for that service will open in the right column. Click the link(s) to the service document(s) (Figure 5, B) to retrieve the it/them.